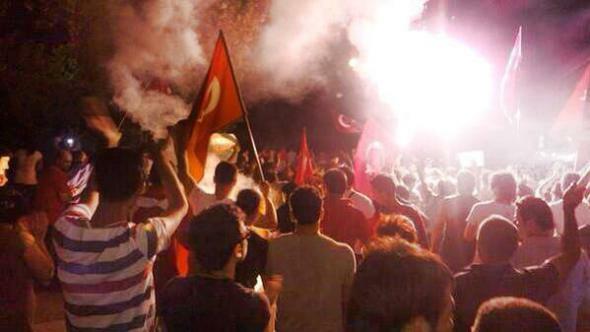 The resistance in Armutlu is becoming an inspiration for citizens all over Turkey. At the moment, the neighbourhood is firmly controlled by the people. Police don’t even try to conquer it any more. They have lifted the siege. A few days ago, they made a final attempt to enter. We saw footage of that, it was epic. 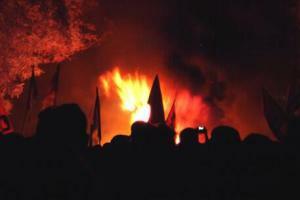 People threw down burning sofa’s from the roofs. Police employed armoured vehicles to break through the barricades, and didn’t succeed. Aside from the burning sofa’s, the most interesting aspect of the resistance is the effective use of strong laser beams. When the vehicles moved in, people were flashing dozens of them at the drivers from the windows of their houses. It turned into a spectacular light show. The demoralizing effect of lasers on an invading force can be huge. When the beam hits you, there’s no way you can see where you are going, but you know full well that’s it isn’t friendly terrain. 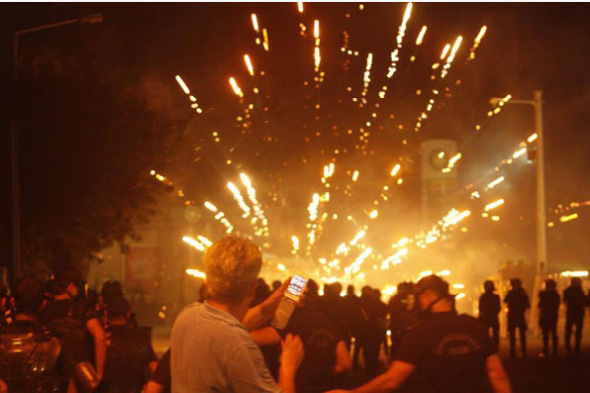 The combined use of lasers and sound in the form of fireworks, flash bangs, chants and pot banging, may serve to further demoralise the invader. The next evening. We are sitting on the grass of Yoğurtçu Park, plotting with comrades from all over Turkey. The occupation of the park keeps steadily gaining a more permanent form. The main Çapulcu cafe has its own storage space now. The library is growing. There is a fenced off playground for kids. There are a couple of tents, and some corners are turned into an open air living room. During the day, there had been organized a ‘free market’, where people could barter things with no money involved. In the evening, there was a forum as usual, and a concert. Above all, the parks have become a place for people to meet, outside of the commercial scenes that have come to dominate social interaction. So we sit around, like many other groups of locals. We talk about the situation in Armutlu. “Police won’t be able to enter Armutlu,” one of the girl says, and she hints that the Kurds have something to do with it. The armed wing of the PKK is right around the corner from Antioch, in Syria, and they are not happy with what the government is doing. A quick reminder of the delicate situation in the Kurdish lands at this moment. Ever since the second Gulf War, the Kurds in northern Iraq have established their own autonomous region. A year ago, they did the same in Syria in the midst of the ongoing civil war. Of course Turkey is extremely concerned about this. They know they’re next. They try to anticipate it by giving life to a peace process, but until now, the attacks of the Turkish army on Kurdish guerrilla’s inside and outside Turkey continue. The repression of the Gezi Park protests further angered many Kurds, so now their patience is wearing thin. They want some proof that the government is serious about the peace process. This week, from Iraq, the armed wing of PKK launched an ultimatum. ‘If you want peace, show it. If you want war, you can get it. You have until Wednesday,’ was more or less the content. No way the Turkish government will ever answer to an ultimatum by people they consider terrorists. Yesterday – Wednesday – the Kurds were attacked by the Turkish army in Syria. They repulsed the attack and subsequently took one of the border posts. Turkish military was forced to retreat, allowing free traffic of people, supplies and weapons between the Kurdish territories in Syria and Turkey. Effectively, the attack on the border may be the end of the peace process. If so, then politics will merely continue with different means, as the saying goes. For the Kurds, the ultimate goal to be attained through peace or armed struggle is not necessarily an independent Kurdish state any more. As a mountain people, the Kurds are suspicious of central government, even if it is this their own. Many of them prefer local decentralised democracy. The autonomous regions in Syria and Iraq are a perfect testing ground for this. After militants conquered the border post yesterday, they reportedly handed control of the territory to the local people’s assembly. Lately, the popular forums are beginning to spread to the universities. Yesterday we were at the campus of Boğaziçi Üniversitesi. Before the forum began, the students had organized an iftar, a Ramadan banquet, together with the Anti-Capitalist Muslims. Surely not all people who participated actually observe the Ramadan, and some were not even Muslims, but it perfectly fitted the spirit of Gezi Park. For one, because it is all about sharing and being together, and for two because it wasn’t organized by any authority, be it political or religious. The students have good reason to organise themselves and to resist in the months to come, as the government is working on a law which will allow police to provide ‘security’ inside the universities. Contrary to the government’s stated aim, it will be more likely that the presence of police will turn the campuses into battlefields. On the short term, resistance is spreading in the southeast. 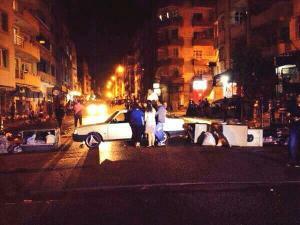 Inspired by the determination of the people in Armutlu, heavy clashes broke out in Adana last night. They will continue this evening. Police are reportedly moving extra forces into the city as the rebels call on all people of Adana to rise up. Posted on July 21, 2013, in Middle East and tagged Kurds, Turkey. Bookmark the permalink. Leave a comment.